I want one* so hard! For some reason, each time I get close to buying one, I chicken out. This may be the push I need. One= either the Multi or the Fast version. Anything is an improvement over the Delica I keep complaining about. 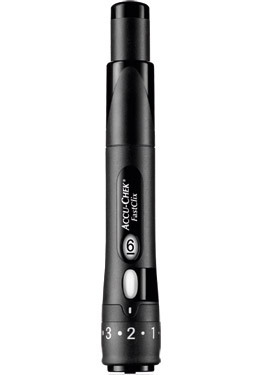 T, the Fastclix works just like the Multiclix in that you have to change it yourself to get a new lancet from the preloaded drum. It’s just that there is a lever instead of having to twist the plunger. Interesting. Thanks for this, Stacey. I’ve been using the little bite-sized OneTouch lancet devices forever, but have been passively looking for a new version. 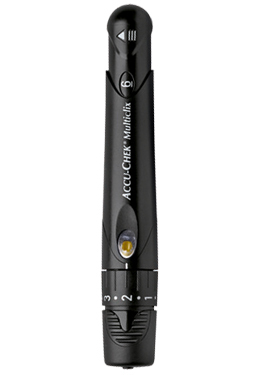 I saw a Delica at a recent ADA Expo and thought that looked interesting enough to try, but now I’m eager to look into the Accu-chek Multi or Fast clix just to get a sense of their use. Great review – much appreciated by those of lancet-lookers out here!! Thanks for the article. Although I love my Multi Clix, I ran out and grabbed an Aviva Plus meter with FastClix to try it out. Stacey, do you know if the drums are interchangeable? Bill – the drums for the Multiclix and Fastclix are not the same unfortunately.